NEW Fall Catalog Arrives July 30th! The all NEW Fall I & Fall II catalog arrives July 30th! Catalogs will mail to all Fresno & Clovis zip codes that day, so keep an eye on your mailbox! 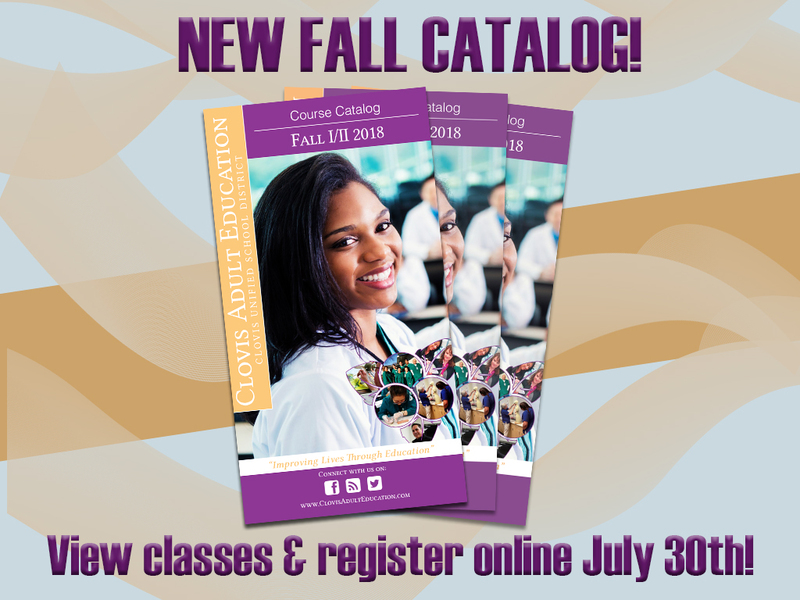 OR if you can’t wait, go online to our website, click on the image of the catalog to view the digital version and browse classes. NEW this session – Creative Writing, Sewing with Patterns, Singing Lessons, Online Selling Workshop, Gentle Yoga, Acrylic Fluid Art, and more! Are you a regular attender to one of our ongoing classes and don’t need to browse? Go straight to the registration page and sign up on the 30th! Register anytime online, by phone at 559-327-2876, or come by the Community Ed office during business hours (Summer hours – M-Th 8am-8pm, closed Fridays!) – we are located on the Clovis Adult Education campus at 1452 David E. Cook Way in Clovis, near the corner of Herndon and Sunnyside. Get ready to Learn Something New this fall with Clovis Community Ed!